If you were hoping that you'd get a free upgrade to the Bulletstorm remaster, we've got some bad news for you. 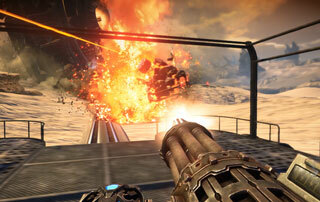 At the Game Awards last week, Gearbox announced that it will be publishing a remaster of Bulletstorm. After seeing free upgrades for the PC remasters of Skyrim, Darksiders, and Bioshock, just to name a few, PC owners of the original Bulletstorm might be hoping that the same thing would be true for this game. Unfortunately, Gearbox has announced that this won't be happening. Furthermore, there won't be a discount for owners of the original game. The news comes from Gearbox CEO Randy Pitchford. When asked by a fan on Twitter if a discounted or free version would be offered, Pitchford responded, "Not possible - completely different publisher, era, platform (they were Games for Windows only), product/sku, etc." As you might imagine, the internet wasn't entirely pleased with that reply. Many replies pointed out that the Darksiders remaster was free, and that it had all those same issues. Pitchford replied that Darksiders represented a "Different case. New owners of Darksiders captured all past/present/future rights. We're just publishing someone else's game." Another tweet asked Pitchford if he wanted to "ruin sales of the game," to which the Gearbox boss said, "If that is a deal breaker for you, you should skip it." While it's certainly disappointing to hear that we'll need to play full price for Bulletstorm: Full Clip Edition, it's not entirely surprising. As Pitchford mentions, it's a slightly different situation than a game like Darksiders where the company owns all the rights to the IP. That said, it's also not likely to do the remaster's sales any favors, especially given that some people are still upset at Gearbox over the Aliens: colonial Marines debacle, among others things. We'll just have to wait and see if this announcement affects the game's market prospects when it launches on April 7, 2017.